Lots of hype around this newly fashioned microfiber towel. Containing more than 200,000 fibers per inch of fabric that can absorb more than seven times their weight in water, not only does this dry your body and hair impressively fast, it’s also soft to the touch and extremely lightweight! It also doesn’t let sand stick or get trapped and it’s fashioned to quickly dry within hours. At most, this microfiber towel (when in the pouch), takes up 11 by 3 inches and 1.1 lb of pliable space in your suitcase. 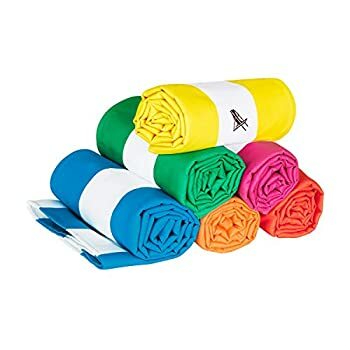 We don’t travel anywhere without these microfiber towels. When it comes to deciding the size, with only a 0.3 lb and 1 inch pouch difference, we went with the XLarge microfiber towel instead of the Large, giving us 15×4 EXTRA inches in space when sprawled out on the beach. We have used our same microfiber towels for 3 years on all of our travels and they are still in perfect condition. No rips, no tears, no fading of color. They are seriously awesome towels and the retro cabana style is visually appealing no matter where in the world we are. Do yourself (and someone else) a favor and get the XL! The dimensions are 6 ½ feet by (almost) 3 feet. You can nearly fit two people on this towel or sprawl out into a star and still fit on the towel. It makes a difference and it takes up no extra room in your suitcase or travel bag. **Makes for a great holiday gift for just about anyone.